“Each act is virgin, even the repeated one”. (Cage quoting René Char). A palimpsest is a manuscript whose original text has been scraped or washed away and overwritten with a new one. My Palimpsest for string quartet and electronics is a set of allusive “overwritings,” personal compositional dialogues with other musics and their (sometimes hidden) references and meanings. Frontispice (onto Ravel on Schoenberg through DeGaetani) references two later song cycles by Ravel, his Trois poèmes de Stéphane Mallarmé (1913) and the Chansons Madécasses (1926), elements of which seem to spring more from Schoenberg’s early atonal (or very late tonal) language than from the composer of Mother Goose. A vestige of Mezzo-soprano Jan DeGaetani’s voice appears in the electronic part, singing text from the latter cycle’s final song, “Il est doux” (“It is sweet”): (“Singing pleases my soul; and dancing is nearly as sweet as a kiss.”), mingling with recurring quotations of the first drone and very last chord of Schoenberg’s Verklärte Nacht. Quodlibet (onto Cage on Satie, Boulez, and Duchamp) points to the work and philosophy of John Cage, particularly his 1950 Quartet in Four Parts. Like the 1950 Quartet, Quodlibet is constructed of musical “gamuts”: short, highly-detailed sonic/musical moments initial composed without regard to their eventual context. The electronic part uses Cage’s spoken voice, often quoting or paraphrasing others, referring back to Cage’s own ideas about music. Lachrymae (onto Crumb on Dowland) echoes George Crumb’s use of John Dowland’s 1596 Pavana Lachrymae (“Flow my Tears”) within his 1970 Black Angels, bringing the Dowland melody and text to the musical surface and resonating it within my own melancholic, Crumb-inspired harmonic and timbral world. About: The JACK Quartet electrifies audiences worldwide with “explosive virtuosity” (Boston Globe) and “viscerally exciting performances” (New York Times). David Patrick Stearns (Philadelphia Inquirer) proclaimed their performance as being “among the most stimulating new-music concerts of my experience,” and NPR listed their performance as one of “The Best New York Alt-Classical Concerts Of 2010.” The Washington Post commented, “The string quartet may be a 250-year-old contraption, but young, brilliant groups like the JACK Quartet are keeping it thrillingly vital.” Alex Ross (New Yorker) hailed their performance of Iannis Xenakis’ complete string quartets as being “exceptional” and “beautifully harsh,” and Mark Swed (Los Angeles Times) called their sold-out performances of Georg Friedrich Haas’ String Quartet No. 3 In iij. Noct. 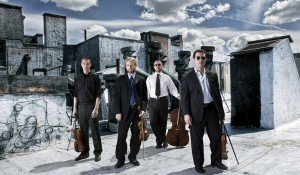 “mind-blowingly good.” The quartet’s recording of Xenakis’ complete string quartets appeared on “Best Of” lists from the Los Angeles Times, Boston Globe, New Yorker, NPR, and as “one of 2009’s most impressive recordings” from Time Out New York. Comprising violinists Christopher Otto and Ari Streisfeld, violist John Pickford Richards, and cellist Kevin McFarland, JACK is focused on the commissioning and performance of new works, leading them to work closely with composers Helmut Lachenmann, György Kurtág, Matthias Pintscher, Georg Friedrich Haas, James Dillon, Toshio Hosokawa, Wolfgang Rihm, Elliott Sharp, Beat Furrer, Caleb Burhans, and Aaron Cassidy. Upcoming and recent premieres include works by Alan Hilario, Peter Ablinger, Gregory Spears, Elliott Sharp, Jason Eckardt, and Hannah Lash. The quartet also offers fresh interpretations of early music, including works by Don Carlo Gesualdo, Guillaume de Machaut, and Josquin des Prez.